Starhub used to be a darling stock for most dividend investors. With a generous track record over a decade of paying out a relatively high dividend yield, its business is also fairly defensive and recession-proof. 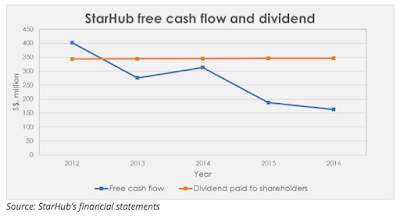 There have been a few good articles about Starhub’s recent slash in dividends, which you can read here, here and here. In this post, I’ll be looking at the red flags that signalled this impending dividend cut as well as whether this drop could present a buying opportunity for Starhub right now. You can see that for the past 7 years, they’ve been fairly consistent in paying out $0.20 in dividends (or 5 cents per quarter). Furthermore, if you had been lucky enough to have gotten Starhub shares at IPO ($1.15), you would have made a lot of money through capital gains and dividend payouts. Nice! Up till 2015, it seemed as though Starhub could do no wrong, and that its share price could only go up and higher. Until it all came tumbling down. That was when IDA announced they would give a 60% discount to allow a fourth telco to bid for Singapore’s airwaves. 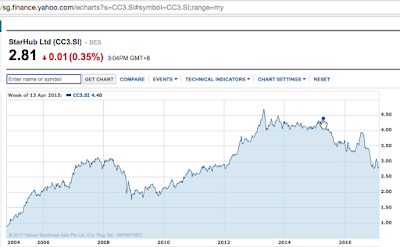 Starhub’s share price (together with SingTel and M1), took a beating, and rightfully so. A fourth telco would eat into the profits made by the existing three providers in Singapore’s oligopolistic market, and there could even be a potential price war breakout to try and win over / retain existing customers. 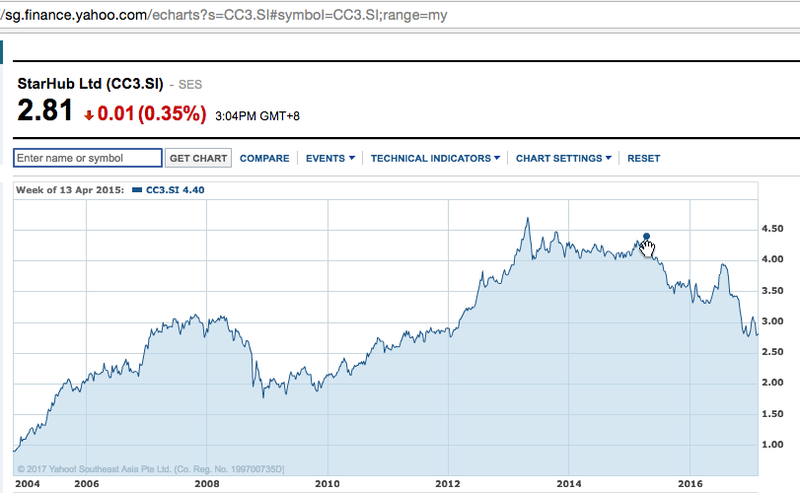 Today, Starhub’s share price sits at $2.80…a far cry from its days of $4.71 (May 2013). Aside from the capital losses, they’ve also recently announced that they’ll be slashing their dividends by 20%. Jeng jeng jeng. What went wrong? But BB, Starhub has been paying out regular dividends for the past 7 years leh. Even during the 2008 global financial crisis, they have been very consistent. (i) Take from their cash reserves to pay the dividends. (ii) Borrow money to pay the dividends. In this case, Starhub has chosen option (iii). Not necessarily a bad choice, as they would need to conserve money when times are hard, but of course this may lose them some favour among their shareholders who were hoping that the $0.20 dividend payouts would continue for a long, long time. 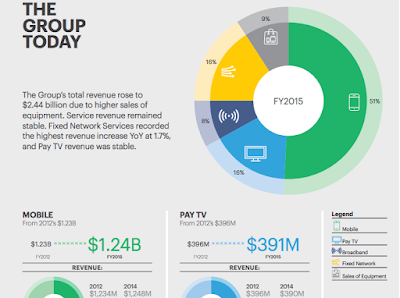 Half of Starhub’s revenue comes from its mobile business. If 20% of Starhub’s subscribers were to switch to the fourth telco, or any other competitor due to the price attractiveness, they would almost immediately lose about 10% of their revenue. Just imagine the impact that will have on its profits. We should note that there is little customer loyalty in the telco business and that the business is quite price-sensitive. Customers will easily jump ship if a competitor telco offers them bigger discounts or more incentives such as more GB of mobile data. Although I’m loyal to my telco now (due to my horrible experience with SingTel’s customer service personnel), I may not hesitate to jump ship if a competitor telco can offer me better perks with cheaper pricing than what I’m currently paying every month. Could one have known that a dividend cut was coming? Yet, Starhub’s dividend payouts have outstripped its free cash flow for the past few years, so that was a sign that the company was struggling to keep up its dividend payments. It was, for this main reason, that I decided to avoid Starhub when I was analysing it as a potential dividend stock to add to my portfolio. The shortage during this period has been funded largely by an increase in the company’s borrowings (option ii) to keep up their dividend payouts. But while there were warning signs, no one could have seen directly into management’s mind to confirm whether or not a dividend cut was inevitable. Starhub’s balance sheet is quite healthy with room for them to borrow more, so there was a chance that Starhub could have opted for (i) or (ii) above as well. Is the dividend cut temporary? Could Starhub reinstate its 5c quarterly payouts again in the future? Starhub’s CFO said that Starhub may face a shortfall in funds this year, which could lead to more debt. So, what happens in the future is uncertain. If Starhub recovers, I do not doubt that management could reinstate the dividend payouts back to 20c per annum as they’ve a track record for rewarding their shareholders. However, if times continue to be hard for Starhub and they’re unable to navigate through this crisis period well, then shareholders may never see their dividend payouts returning to previous norms again, and there could even be a chance of further cuts. I wrote last January about how there’s no guarantee that you will be getting your projected dividend yields when you invest in a dividend stock. Instead of looking at historical dividends as a guidance, we need to question whether the dividends are sustainable. To get an answer, we should be focusing on the company’s fundamentals and the outlook ahead in order to ascertain whether our thesis for investing will continue to play out. Is Starhub a good buy now? At today’s price of $2.83, the dividend yield now will be 5.65% if Starhub does not cut its 4c quarterly dividend any further. If you’re investing for income, there are other stocks that offer higher than 5.65% dividend yield in contrast to Starhub. As for the rest, we do not know the true impact of a fourth telco to its competitors’ earnings yet until it happens, so the next 3 years will be a crucial time to watch. In the meantime, I prefer to stay on the sidelines without being invested, but will continue monitoring Starhub’s stock and if there’s an opportunity to buy in, I may not hesitate to take up a small position. Should I get a HDB or a bank loan?